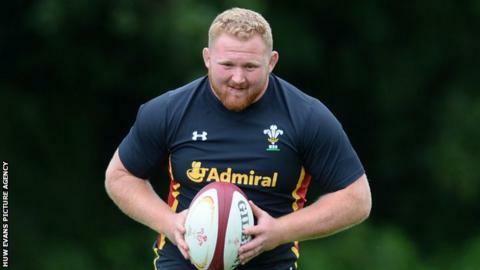 Prop Samson Lee is likely to start against Uruguay in Wales' opening game of the Rugby World Cup, according to attack coach Rob Howley. Full-back Liam Williams is also likely to start, though he has not played since having foot surgery in June. "At this moment in time it's a clean bill of health for the players I've just mentioned," Howley said. "Time on the rugby field is important to any rugby player and the length of time both players have been out you can expect them to be likely starters against Uruguay." Howley added Alun Wyn Jones, who injured a knee in the 16-10 win over Ireland on 29 August, would also be fit in time for the opening game of the tournament. However, it is unclear if the Ospreys second-row will be risked against Uruguay six days before Wales face England at Twickenham. Howley said the squad had coped well with the loss full-back Leigh Halfpenny and scrum-half Rhys Webb, who were both ruled out of the tournament after suffering injuries in the 23-19 win over Italy. And the former Wales and British and Irish Lions scrum-half praised Mike Phillips, who has been recalled to the squad in place of Webb. "The way he dealt with not being selected first and foremost was a huge plus and a positive for us," he noted. Howley said he had been impressed with the "maturity and the way he accepted that decision and wanted the best for Lloyd [Williams], Rhys [Webb] and Gareth [Davies]" after his omission from the squad. He added: "We've got him to come back in now with his experience, he's a street fighter. The physical attributes of his game are there for all to see. "I think we're fortunate from a national perspective to call on someone of Mike's ability and physicality."